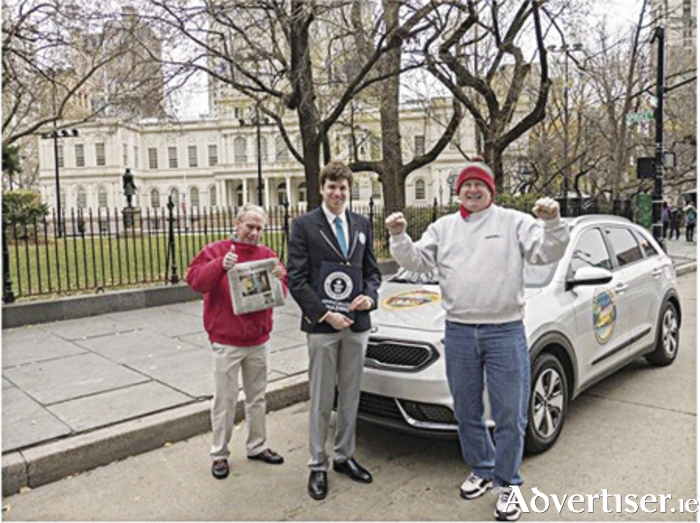 Arriving at New York City Hall in downtown Manhattan, the 2017 Kia Niro officially received a Guinness World Record title for the lowest fuel consumption driving across the USA from coast to coast (hybrid car ). The new record-setting mark is an incredible 76.6 mpg. The Niro EX was driven by Wayne Gerdes of Carlsbad, California, and co-driver Robert Winger of Williamsburg, Virginia, from Los Angeles City Hall to New York City Hall (93,715.4 miles ) using only 48.5 gallons or 4.1 tanks of petrol. The vehicle was not altered in any way for the attempt. The Niro, an Urban Crossover Hybrid Vehicle, is the first dedicated Kia hybrid and was conceived to bridge the gap between outstanding fuel economy and compact crossover usefulness. In addition to its athletic and attractive design, the Niro’s long list of features includes a specially designed, innovative hybrid system to provide a more dynamic and engaging driving experience. It also offers a spacious cabin with lots of room for five occupants and their gear. A full array of advanced driver assistance features are also available. These included: autonomous emergency braking, blind spot detection, rear cross traffic alert, lane change assist, lane departure warning, and advanced telematics and entertainment equipment. The all-new 2017 Niro is on sale in Ireland with an entry level price of €29,095. This includes the €1,500 Government VRT reduction.